Apple will unveil the highly anticipated iPad Mini on Tuesday, October 23, according to a new report from the well-connected AllThingsD, in line with their previous report. The iPad Mini is intended to compete against the range of 7″ Android tablets that are gaining popularity, and also fight the oncoming swath of Windows 8 tablets. Android competitors tend to be feature rich despite selling for low prices, including the Kindle Fire at $159 and Nexus 7 at $199. It’s unclear how Apple plans to price the iPad Mini given the iPod touch fills the $199-$399 range, but market expectations are for a competitively priced device. No retina display = not worth it. Exactly: no retina = no go. It’s just rumors for now so it still COULD have retina. But I do agree with everyone else, without it I will just wait it out. Being Apple and they love their margins, I have a feeling it will not be competitively priced. $349 or $399 or something high, otherwise why the heck would anyone buy the iPod Touch which is overpriced at $299? Who would buy that anyway when the Nexus 7 is $199? The iPad at $499 is a good buy but it’s starting to feel expensive. None retina = none apple!!! Yes apple, lets go backwards! Very disappointed..! It’s a rumour and you’re disappointed? Get a life. I think it will start at $249 for a 8GB version. I echo all other sentiments too, if no retina then the display will be the weakest part and have no compelling reason to buy except the App Store ecosystem. Why are people surprised “no retina?” We already knew it was not going to has such screen. Most people won’t care or honestly can’t tell the difference to the average eye. Apple will sell 5 to 10 million of these babies through the holiday. They will fly off the shelve. The $199 price point will make that happen. I will be getting one. The bigger iPad is just that – bigger, heavier, harder to hold, and not worth the extra $200. But then again, where are those Apple fans yelling that there would be no such thing as an iPad Mini? Silly rabbits, tricks are for kids. why is everyone crying about not having retina? oh please….Do you guys even notice that much difference between retina and non-retina. I had the first gen ipad and the lastest version and I don’t even noticed any degrading quality so stop crying and acting like retina is the sh*t.
iBooks. Anyone who can’t see the difference hasn’t tried both. Non-retina looks like pixelated garbage and the retina is book-quality. Since they appear to be positioning the Mini as a Reader-competitor I think they’ve missed the boat here. same goes with people who claimed they notice differences in 720p and 1080p. Bunch of retards act like they know..
For movies and games you cant tell the difference between retina and no retina, but for reading it’s night and day. iPad 2 looks like ancient technology next to iPad 3 screen. Retina? I just have to laugh at people complaining about a feature not being in a product, the existence of which at best is still rumoured, and therefore is still in the imagination of the web-reading and writing public. I too have iPad 1 and iPad 3 and in a blind test few can tell which has the retina display. One can only wonder how many of the ‘experts’ mouthing off above have done a blind test. Same goes for the MacBook Pro. RD would destroy the economics; there are enough rumored production issues already and the RD iPad 3 takes 50% longer to recharge than the iPad 1/2 owing to the increased battery capacity required. 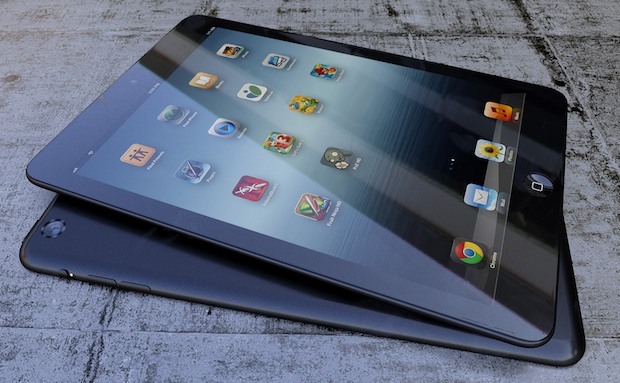 The real plus in the Mini will be the speedy A5X CPU whose presence is easily noticed in the iPad 3 compared wity the iPad 1. Mmhh.. if ppl are not seeing the difference between retina or not retina screens, I’ll suggest new glasses. The minute Apple focuses on competing on price is when this fails terribly. Do not price the iPad mini at the $199 price point, Amazon and Google will drop their prices and it’ll become a race to the bottom. There’s a certain level of quality I’ve come to expect out of Apple products, and I fear it may come into question with a low price point like that.